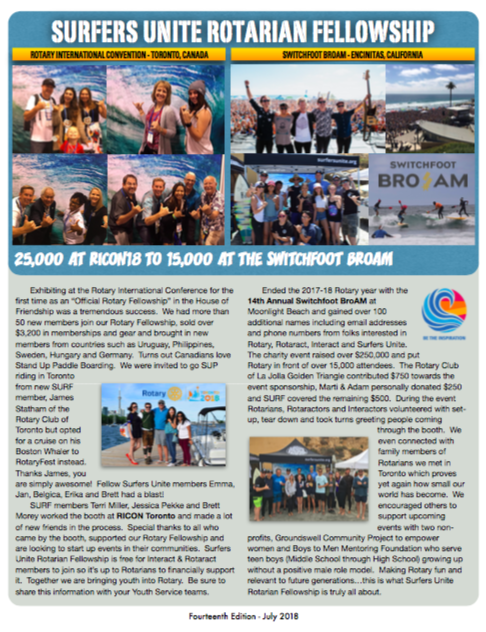 #RICON18 in Toronto was equally amazing as the 14th Annual Switchfoot BroAM. 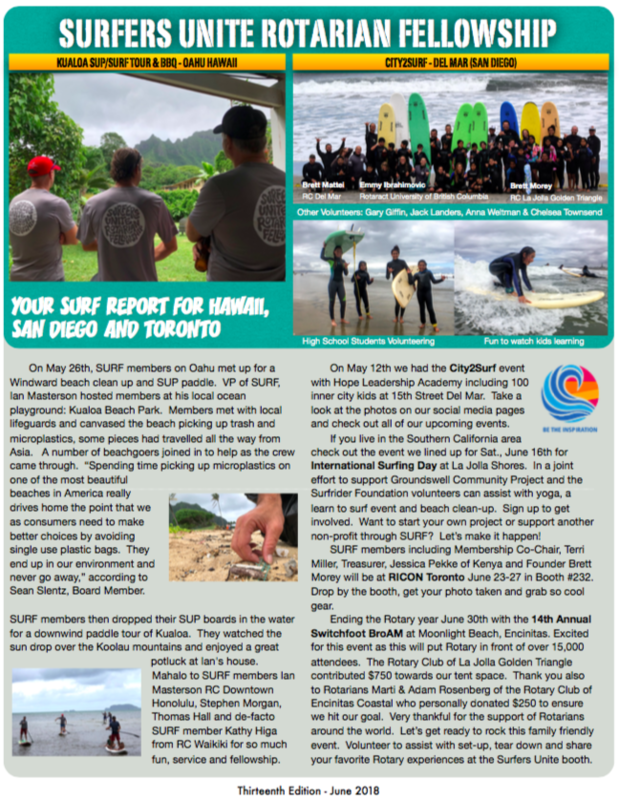 Read the latest and invite others to get "on board" with the fastest growing Rotary Fellowship on the planet, Surfers Unite Rotarian Fellowship. SURF Report for Hawaii, San Diego and Toronto...Get the latest right here! Thanks to Board Member Sean Slentz, Vice President Ian "The Surf Professor" Masterson and several Lifetime Members things on Oahu are heating up. No folks, not talking about lava though there are plenty of ways we can help on the Big Island right now. This Thursday, May 24th from 5PM to 9PM Ian will be discussing the History of Surfing at the Treehouse Kailua. Purchase tickets in advance and bring some friends. Ian and the crew also have an event this Saturday including a Hawaiian BBQ & Surf event so "Get on board" and be part of the action. The City 2 Surf event at Del Mar was a great success. SURF members long with over 25 volunteers took over 80 inner city kids surfing and worked with them to do arts & crafts. This is the 6th year of this event through Hope Leadership Academy and we were blessed to have NFL Running Back Donald Brown share words of encouragement with the kids during lunch. Donald played for the Indianapolis Colts, San Diego Chargers and New England Patriots. Not sure if Donald can surf but we're willing to take him anytime. Over 400 photos in the Google Photo Album. 1st Group of surfers included SURF Members Brett Mattei, Emmy Ibrahimovic, Brett Morey and friends in the surfing community Gary Giffin, Jacker Landers Anna Weltman. Group 2 included SURF members Brett Mattei, Brett Morey, Emmy Ibrahimovic and fellow surf instructors Gary Giffin & Jack Landers. Group 3 included SURF Members Brett Mattei, Brett Morey, Emmy Ibrahimovic and friends in the surfing community Anna Weltman, Chelesa Townsend and Gary Giffin. Our May newsletter has been added to the archives and if you haven't looked at it yet you just might want to download it and share it with friends. Time is running out to become a Charter Member of the fastest growing Rotary Fellowship on the planet. 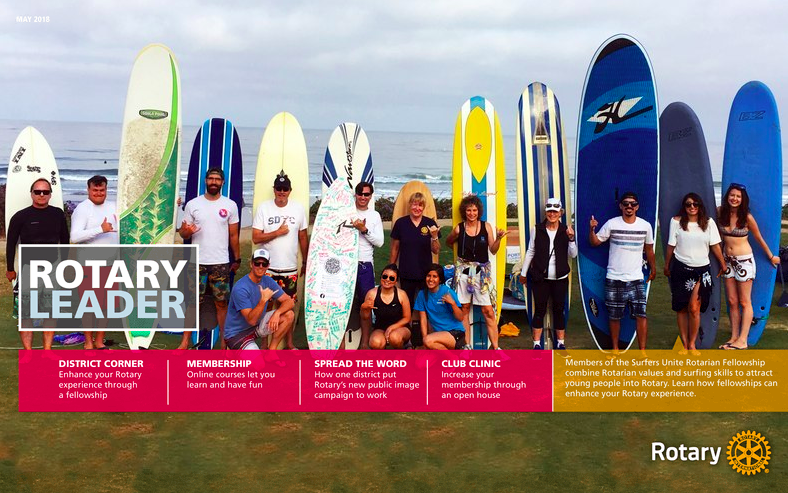 Join today and start a chapter Of Surfers Unite in your area of the world. The SURF members in Hawaii are coming along with another event on the 26th of May. The April 2018 newsletter is out and uploaded to the site. So much good stuff we could hardly wait to tell you all about it. I also just confirmed last night that the 2018 Boys to Men Mentoring 100 Wave Challenge Event has been confirmed as Sunday, October 7th. Congratulations to the entire San Diego State University Rotaract Club and especially leaders Jamie-Lee Miller and Cha Cha Jones for an incredible event. 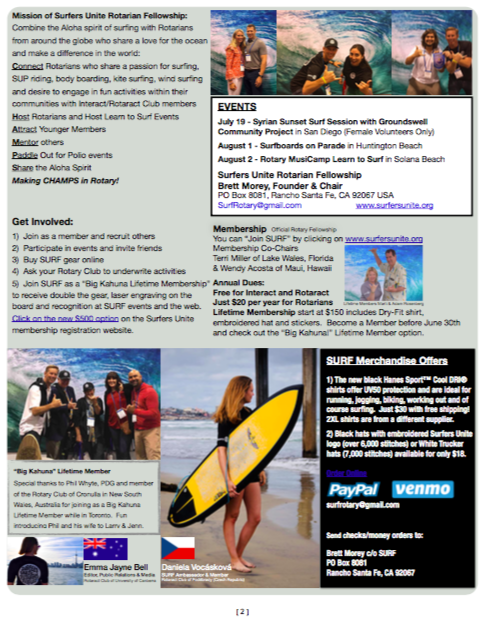 Surfers Unite Rotarian Fellowship is all about connecting Interactors, Rotaractors and Rotarians as one family. Hope to see you at our upcoming events including the April 27 Bondfire Event at Crown Point. Here is the Google Photo Album from today's event! Enjoy! Special thanks to Arnold Grahl of Rotary International, Senior Writer and Editor of Rotary Leader and Rotary Voices for publishing the following. Looking forward to seeing Arnold when he comes to visit "The Most Dynamic Rotary Club in the World" in April. Truly humbled by the responses of Rotarians, Rotaractors and Interactors around the world. 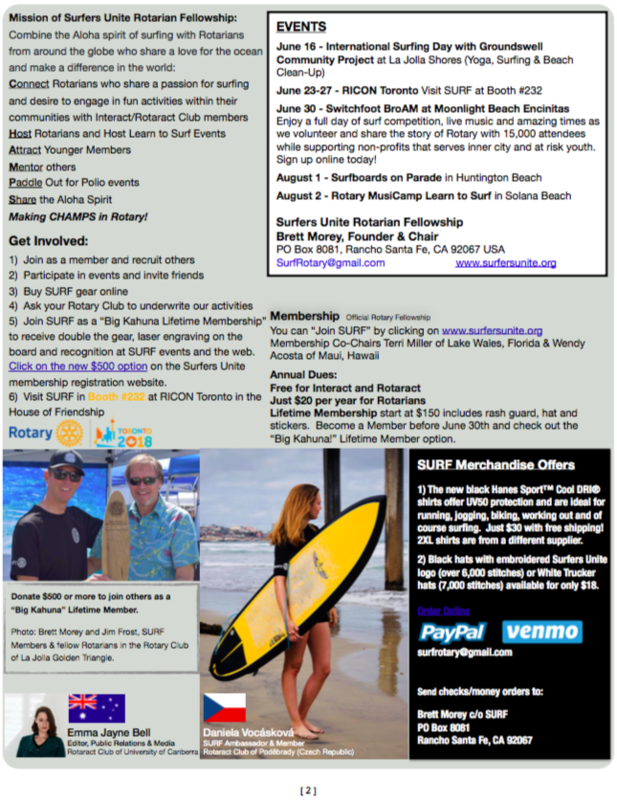 Get on board and thank you to all who are supporting Surfers Unite Rotarian Fellowship.